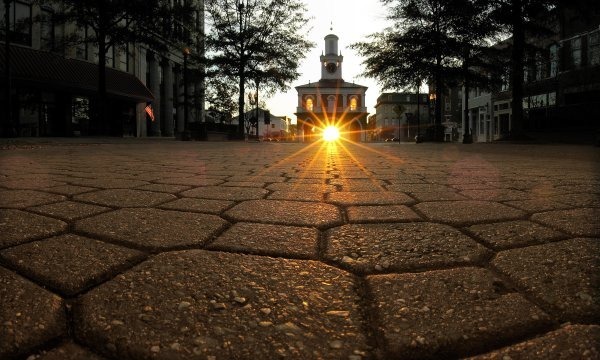 Inspired by the photographic work of Mr. Johnny Horne, photo editor, Fayetteville Observer and author Backyard Universe, I departed for downtown Fayetteville at 6:25 a.m. to give the sunrise photo opt my 3rd go. The sun will be lower in the sky as it passes over Person Street and peers through the Market House to photographers on Hay Street seeking the ultimate keeper—”a Johnny Horne like” photo of a magnificent sunrise. In preparation, I captured these on Tuesday and these Wednesday morning. What will I get today??? This is the challenge we see as try for perfection or close there to. This is really a fantastic shot! Rare are those situations when windows align such that the sun shines right through the building.